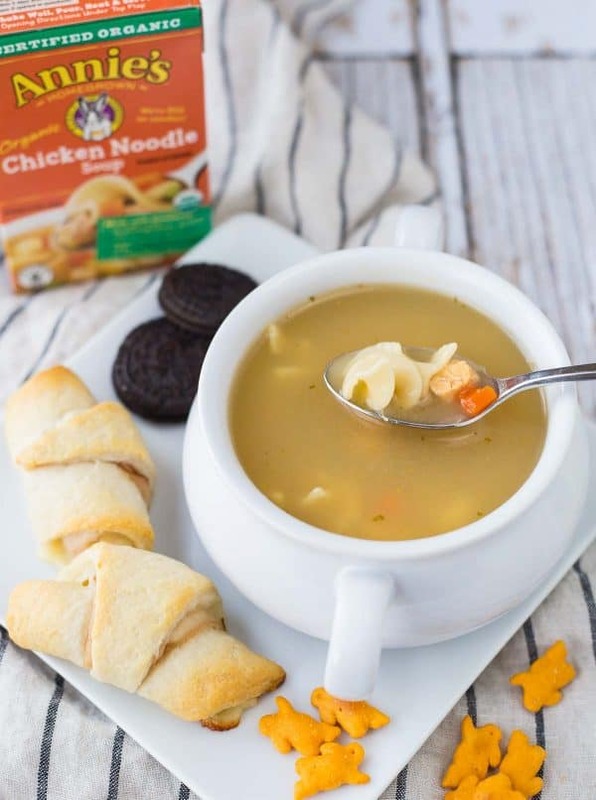 Pair these turkey and cheese crescent rolls with a hot bowl of cozy chicken noodle soup for a quick and delicious meal on even the busiest of days! This post is in partnership with Annie’s. All opinions are my own, in fact, I buy their products nearly every time I go to the store. Thanks for supporting Rachel Cooks by reading about brands I use and love in my own home. Anyone else slightly freaked out that Thanksgiving is already this week? I can’t believe how quickly time is flying by. I’m making my lists and checking them twice — I’m hosting this year and I feel like I am not ready at all! But it’s only my closest family members and I know no matter what, it will be great. 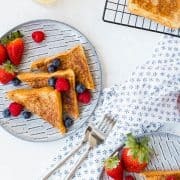 When I have a big event coming up at our house, I always make sure that I have some simple dinners planned for the days leading up the the big event. 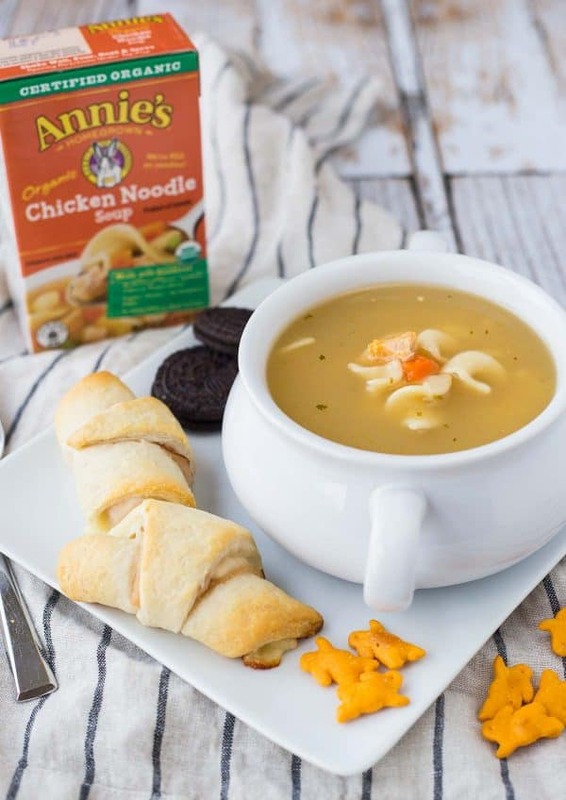 I’m excited to be teaming up with Annie’s to share this easy lunch or dinner idea. If you opened my pantry right now, you’d see Annie’s soup, macaroni and cheese, crackers, fruit snacks, and cookies. Probably more, but that’s all I can think of off the top of my head. (All paid for with my own money, fyi.). So naturally, when they approached me and asked me to spread the word about their tasty soups, I jumped right in! 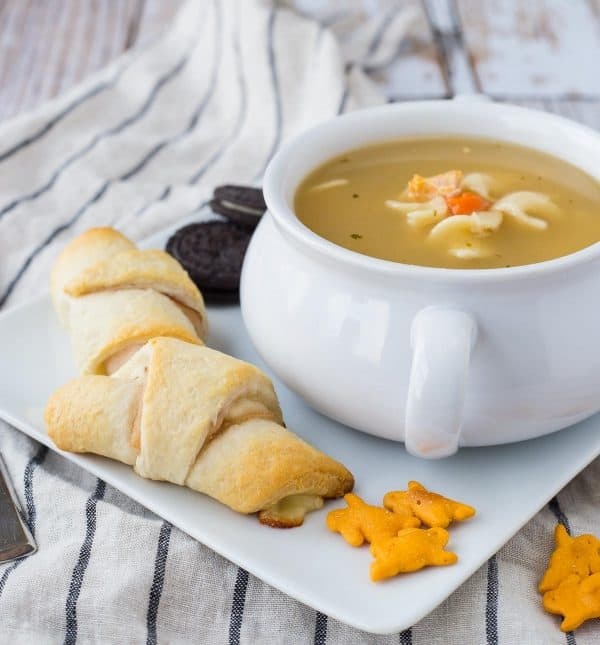 I wanted to pair something with their Organic Chicken Noodle Soup, so I threw together these quick and easy turkey and cheese crescent rolls. Did you know Annie’s made crescent rolls? And they’re organic! I simply put some turkey and provolone onto each crescent roll before rolling it up and baking it. My kids loved these and I loved these. They were the perfect complement to the soup. I mean what’s better than a soup that’s ready to go? 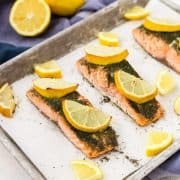 All it needs is to be heated, you don’t even have to add water! 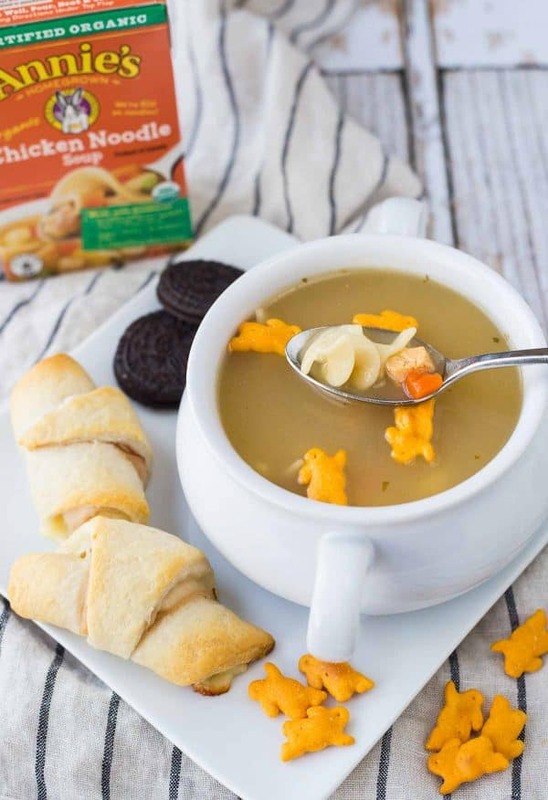 Oh and by the way — the chicken in this soup actually looks and tastes like chicken. It’s raised without antibiotics and the soup is certified organic. Kids are happy, mom and dad are happy, everyone is happy. Am I right?!?! Plus the corkscrew noodles are so fun and plentiful! Topped with adorable cheddar bunnies and served with a couple of Grabbits, it’s a quite tasty meal. And ready in less than 20 minutes! On a baking sheet lined with parchment paper, unroll Crescent rolls. On top of each triangle, add 1/2 slice provolone cheese and one slice turkey. Roll up and place on pan. Bake for 11-14 minutes or until golden brown and cooked through. Verdict: I loved these turkey and cheese crescent rolls so much and they went perfectly with the soup. 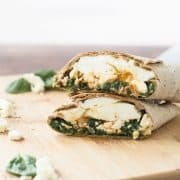 Husband’s take: He didn’t have the opportunity to try these, but the kids loved them! Changes I would make: None are necessary but you could switch up the meat and cheese with whatever types you have on hand. I had nooo idea Annie’s even made crescent rolls! 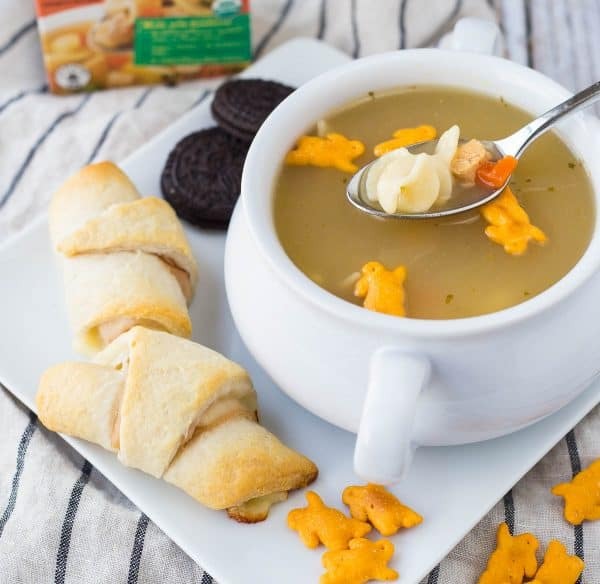 These are such a fun idea and the soup is obviously adorable! !